The Inaugural Address of John Kennedy instilled strength in the nation of the new generation. This is a topic suggestion on Inaugural Address of John Kennedy from Paper Masters. Use this topic or order a custom research paper, written exactly how you need it to be. To have a sense of pride in their nation and to serve their country in everything they do. One of the first lines in Kennedy’s speech is, “The world is very different now.” He is referring to man’s ability to destroy the world with a simple push of a button—the nuclear capabilities of the two dominant powers, the United States and the Soviet Union. This, he says, has caused them all to rethink their outlook on the future, focusing not on the sustainability of one nation, but on the concept of global peace. Kennedy was the first American president born in the 20th century, and he makes this known to the citizens of the nation. He, like them, is a member of a new generation, one that has seen their lives shaped by two global wars and the creation and implementation of a so-called doomsday device. He says that he, like them, is unwilling to watch human rights be violated, to allow security to be threatened, or to have the strength of this nation questioned. He implores the people of America to “ask not what America can do for you—ask what you can do for your country.” He tells the people of the world to “ask not what America will do for you, but what together we can do for the freedom of man.” He is the leader of a new generation in the free world, and he ensures listeners know this will temper his approach to the problems this new world will present. Kennedy and Vietnam Research Papers look at the shortcomings that the United States had in its approach toward the Vietnam conflict. U.S. Federal Government essays examine the three branches of government as outlined by the Constitution: the Executive, the Legislative and the Judiciary. John Quincy Adams Becomes President - John Quincy Adams Becomes President as the second U.S. President in 1797. William Clinton's Inaugural Address - William Clinton's Inaugural Address concentrated upon the theme of renewal. Inaugural Address of Richard Nixon - Inaugural Address of Richard Nixon focused on the new horizons and discoveries that have been experienced in the United States and on Earth. Inaugural Address of Martin Van Buren research papers discuss key points of his address. 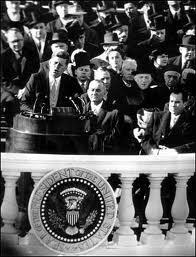 Inaugural Address of Franklin Roosevelt research papers discuss President Franklin Delano Roosevelt's inaugural speech. Inaugural Address of Herbert Hoover research papers discuss how Hoover's address was centered on the Eighteenth Amendment of the Constitution. Thomas Jefferson's Inaugural Address research papers discuss how he delivered his first inaugural address on March 4, 1801. Inaugural Address of James Madison - The Inaugural Address of James Madison addressed the nations of the world and clearly stating American foreign policy as it would be carried out under his leadership. Inaugural Address of Harry Truman research papers discuss President Truman's inaugural speech. Inaugural Address of James Polk - Inaugural Address of James Polk spoke fully about the annexation of Texas and used references from history, the Constitution, and philosophy to defend American expansion “as a way of creating and preserving a more powerful Union”. Inaugural Address of Andrew Jackson - Inaugural Address of Andrew Jackson research papers discuss the tone of Andrew Jackson's inaugural speech and how it refers constantly to the US Constitution. Inaugural Address of Ronald Reagan - Inaugural Address of Ronald Reagan addresses what is probably the greatest problem of modern-day America: money. Inaugural Address of Lyndon Johnson research papers discuss Lyndon Johnson taking the oath of office after Kennedy's assassination. Inaugural Address of Theodore Roosevelt research papers explains Roosevelt's plan that would help bring America to the greatest heights of glory. Inaugural Address of President Woodrow Wilson research papers discusses the theme of bipartisanship in his inaugural address. Inaugural Address of Dwight Eisenhower research papers explains that he Eisenhower was the first republican President in 20 years. Inaugural Address of Ulysses S. Grant research papers discuss the themes of stability, security, and pride in Ulysses S. Grant's speech. Barack Obama's Inaugural Address Research Papers on how Barack Obama presented his inaugural address on January 20th, 2009. Inaugural Address of Abraham Lincoln research papers are custom written to your specifications by Paper Masters. Lyndon Johnson Becomes President research papers explain LBJ's first inaugural address, which focused on upholding commitment to the country. President and Congress research papers discuss the divisions between the executive and legislative branches of the federal government. John Adams' Inaugural Address - As the second President of the United States, John Adams offered his inaugural address on March 4th, 1797. Geneva Accords research papers show how Vietnam was split prior to the United States entering Vietnam. Paper Masters writes custom research papers on Inaugural Address of John Kennedy and discuss Kennedy's speech, which instilled strength in the nation of the new generation.